The dedicated server that Mavicus is renting in Houston, Texas will have a scheduled downtime on March 13, 2010 at 10PM CST (March 14 — 12PM in Manila). A new 250GB backup hard drive will be installed. The installation and testing will take about two hours to complete. If you are one of those email account users that is having a problem sending emails with attachment try modifying your outgoing SMTP port from 25 to 587. Most ISP blocks traffic on port 25 unless you are using their services (or their server) to send email. Please note that port 25 will still work as long as your ISP is allowing it. Port 587 is an alternate port that was included in the new setup when all the hosting accounts managed by Mavicus I.T. Solutions were moved to Houston, Texas. Below are some screenshots on how to modify an existing Microsoft Outlook 2007 configuration. 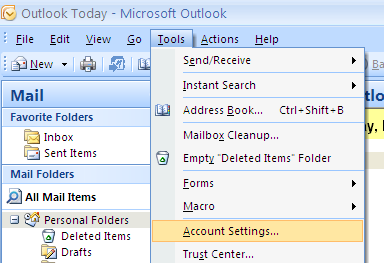 Step 1: Click on “Tools > Account Settings…” from the toolbar menu. We are currently in the process of moving our server account from New York to Houston, Texas. All the web hosting accounts of our clients will also follow the move within this weekend, December 6-7, 2008. By next week all web hosting operations will be back to normal. As our client, should you experience any problems such as not being able to access your website or email will only be temporary. 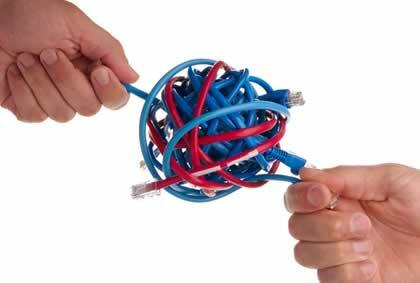 For technical support you can contact us at 047-431-3582 or thru cellphone at 0917-919-1563. After months of being stuck with a “Under Construction” page, I finally had the time to rework this website. I decided to use WordPress as a CMS to manage the contents. From this point forward I’ll be posting my projects here. I’ll also write about the different technologies that I’m using on my projects. As a software developer I have been using Open Source technologies like Linux, Apache, MySQL, and PHP (LAMP) on my projects. I always believe that any business—big or small should concentrate their budget on the custom software solution itself instead of the background technology like the operating system and database engine.